Advance Tabco CR-RS-12 Stainless Steel Blender Station with Dump Sink and Faucet - 12" x 26"
Enhance staff efficiency and productivity when preparing specialty drinks with the Advance Tabco CR-RS-12 stainless steel blender station with dump sink. This unique item combines a recessed step with a 9" x 9" x 10" dump sink for unparalleled convenience. The stainless steel step features a grommet hole for blender power cords, in addition to a hidden 15A/120V duplex outlet beneath the shelf. A 4" backsplash works to protect nearby walls and floors from liquid spills, while a rear deck provides even more storage space. Included in the design is a 1" IPS drain and deck mount gooseneck faucet which meets federal lead standards, making this innovative blender station perfect for your high volume restaurant or bar. 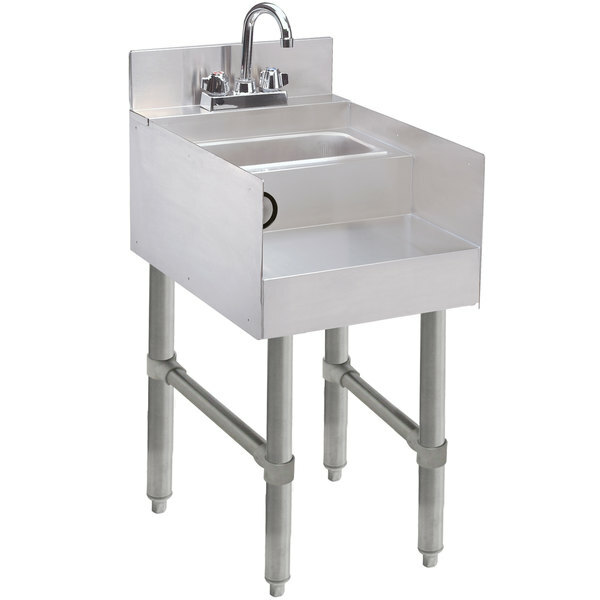 Overall User Rating: Advance Tabco CR-RS-12 Stainless Steel Blender Station with Dump Sink and Faucet - 12" x 26"
We use this sink not as a blender station but as the tiny sink behind the bar we fill our water bottles at. Its depth is perfect for that.